Discussion in 'Stock 1991 - 1994 Explorers' started by MuscleJunkie, July 22, 2011. Had an issue the other day (during 100+ degree temps) that I went out to the Explorer and it would not start. Cranked not issue, but it seemed that no gas was getting to engine. Listened for the fuel pump noise/priming when turning the key to position 1 and didn't hear that. Had it towed to the shop and they report truck started no issues. Could fuel pump being going bad and intermittently stop working? I have never had this issue before. Truck has 205,000 now. The gas gauge doesn't work and I've read that is also related to the fuel pump assembly somehow. Looking to have this fixed so the no start condition doesn't repeat in less than ideal circumstances. Also would like the gas gauge to work again. They have quoted me $167.40 for the fuel pump assembly part but I am thinking it might be better to buy that on my own. Any recommendations on what I will need to replace the fuel pump (if that is what is needed) and correct the gas gauge issue at the same time? 167 for the entire assembly is a good price quoted from a shop. Replacing the pump will probably cure both problems. although, there is a 4 pin wore harness which could have a bad connection, chances are the float is rusted thru and you need a new one. The fuel pump assembly has all of this included. Changing the fuel pump means dropping the fuel tank or cutting a hole in the floor. Are you capable of doing this? only you know that. It is not a beginner job for sure, and you will have issues with the fuel line disconnects. Could fuel pump being going bad and intermittently stop working? I could also see the fuel pump relay doing the same thing (failing open when hot) or the EEC relay. Where is the fuel pump relay and EEC relay? How much to replace them (part cost then labor) and where to buy? check your relay first. mine over heated last summer, replace fuel pump for nothing. it was relay. Since the gauge does not work, my bet is on the pump--wiring at the pump plug ( connector). from the vitamin d link in my signature. rockauto parts has a replacement. As mentioned, the relays can be swapped around but if the problem is intermittent it could be hard to pinpoint. 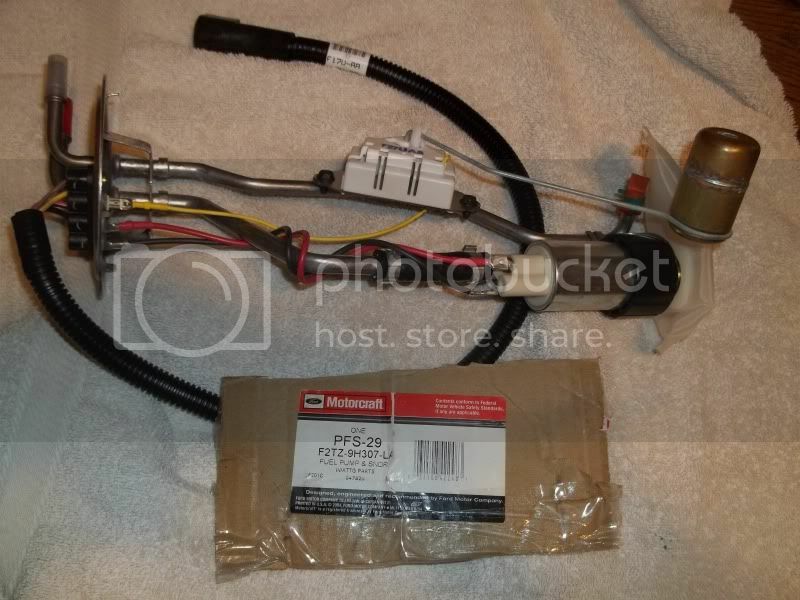 Advanced auto parts has a pump and sending unit combo for right around 90 dollars and have it in stock. Thanks everyone. 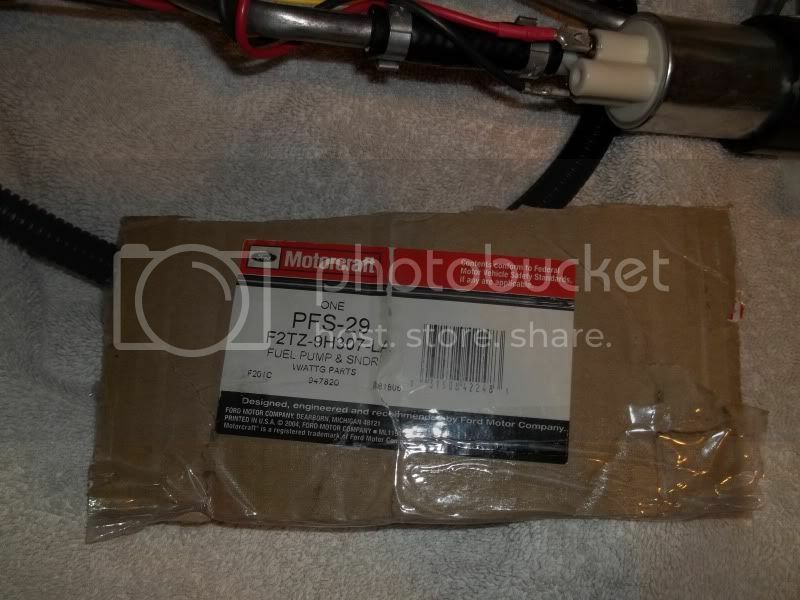 Is there a big enough difference in buying the motorcraft pfs-29 over one of the cheaper ones? I had similar intermittent warm start issues. Drive for 30 minutes, park in sun, leave it for an hour, come back, it starts and idles like it's on 4 or 5 cylinders. I was hoping to catch it in the act with my new fuel pressure gauge, but today it beat me to it and would not start at all. Pressed the pressure port in with a nail, got nothing but a little air pressure. No noise from pump at start. Swapped relays, checked inertial switch, everything ok. Get it home, verify fuel pump failed. Easy replacement, thanks to the instructions and encouragement here. take a relay from something that works like A/C or ABS and switch them. Exactly right. I had this problem diagnosed to the fuel pump without tools while waiting for the tow truck, just by swapping relays and the other usual checks. Thanks everyone. It turns out it was the relay. When purchasing replacement relays - is it best to buy Genuine Ford sealed relays or the cheap ones from AutoZone that are not sealed and seem to come apart if you pull them out too hard. I have been fine with the Adavnce/Autozone relays. If you are worried about moisture and dirt, just smear a layer of silicone all over the whole thing. I always keep a spare in my glove box anyways.